The UNI Panthers should move up from there number 18 rating after dominating 12th ranked Wichita State 70-54 in Cedar Falls on Saturday. Elwin Huffman reports. 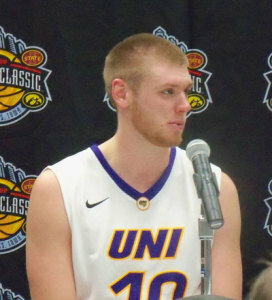 Seth Tuttle scored a career high 29 points and says the home crowd gave the Panthers a lot of energy. “That place was rocking, they get credit for the win just as much as we do,” Tuttle says. Tuttle says the Panthers were confident going into the game. “We knew they were a good team, and they are a great team, but we didn’t really talk about coming in here and beating them by one or two, we talked about beating them by 15. That was our mindset,” Tuttle says. UNI is on the road on Tuesday night to visit Indiana State.